A bat. In the toilet. I know that weird things happen at my house. Once, I found a dead mouse in the toliet. My husband rescued me that time. This time, I was left to deal with the LIVE bat in the toliet by myself. 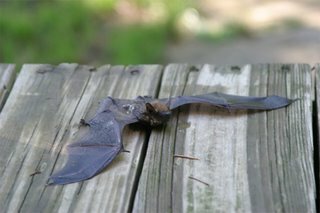 I made an ingenious use of old newspapers, fished out the bat, and put him out to dry on the back porch. We'll see what happens. I think he was pretty cold. And angry. He tried to bite my newspaper, while clicking at me. Here he is. Best of luck, Bat. Hope the cats don't get you.